MasterChef Australia 2014 has been airing for quite a few weeks now and it’s getting more and more exciting as we edge closer to the top 8. At the start of the season, we saw students, bartenders, office workers, a winemaker and many more on the show who had passion and talent for cooking battling against each other. Throughout the season, we’ve witnessed them grow both personally, and in terms of cooking technique and creativity. I feel like my understanding and appreciation for food has also grown with them. 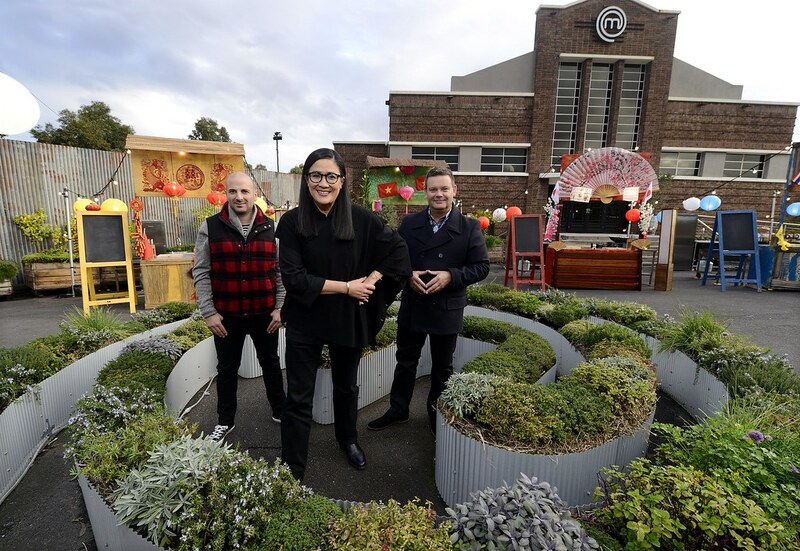 With George Calombaris, Gary Mehigan and, my favourite, Matt Preston, judging the show with their witty comments and inspirational ideas, this season has truly been one of the best. 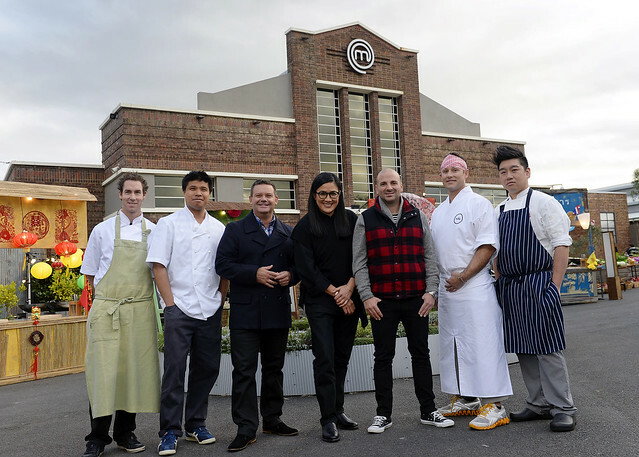 It’s great to see Kylie Kwong mentoring the contestants as well as I think she’s an amazing chef. A number of weeks ago, I attended a MasterChef Australia exclusive blogger event along with Emily from Fuss Free Cooking and Bianca from Wholefood Simply. I know I mentioned here that I ate the lemon lime and bitters dessert made by George Calombaris in episode 2. What I didn’t mention was that I actually visited the MasterChef set that night, ate food cooked by the contestants and took part in the voting during one of the episodes! It’s been difficult to keep all the excitement to myself but finally I can share it with you. As you can see, we were not allowed to take in our cameras or phones so all photos here are credited to MasterChef Australia. The challenge was themed the Asian Night Market Challenge where the top 8 formed teams of two and cooked off against each other. The cuisines were Chinese, Thai, Japanese and Vietnamese. As you can guess, it was an outdoors setting with colourful stalls set up just outside the MasterChef Kitchen itself. The contestants had a total of 2.5 hours to cook for us and 200 MasterChef Australia Facebook fans, which I think is just madness. That equates to less than 45 seconds per serving! We waited for over two hours for the tasting but it was all well worth it. As we stood outside the fenced off area in the cold with constant bursts of tantalising Asian fragrances floating in the air, my stomach was getting unbearably hungry. When we finally heard the countdown for the contestants to stop cooking, I could feel the excitement in the air reach its peak. And then we were let in! I didn’t know what to expect as I had never been on a television set before. With so many cameras everywhere I was actually quite nervous. Considering this was just one episode (and I was just tasting), imagine what the contestants have to go through everyday! We were told not to line up at the nearest stall, but rather spread out to avoid congestion. Everyone listened to the instruction except us and we found ourselves at the start of the line outside the Chinese stall which was the closest to the entrance (the yellow team). The team was made up of Emelia and Amy. We thought since we were there already, we might as well take a plate. It was lucky that we did as the lines to the other stalls grew longer and longer. It turned out that this dish – chinese mushroom and pork soup, glass noodles and pickled baby corn – was our favourite of the night. It was thick, it was hot, it was spicy and it was full of flavour. Since we were all cold and hungry from the wait, this was the perfect start to the tasting. I felt like my soul was being warmed by this little bowl of soup. Next, we decided to try the Thai stall next (blue team),which belonged to Laura and Jamie. The Thai team was the only team to present two dishes. One was the seared yellowfin tuna with cold papaya, cherry tomato and snakebean salad and the other was a coconut braised chicken in broth. We got these dishes to share between us (to save lining up again). I loved the tuna dish. The salad was light, crisp and refreshing while the tuna was seared just right, leaving the original textures and flavours of the tuna intact. I enjoyed the texture of the rustic cuts of raw fish as I bit into them, though I can understand how some people might have found it difficult to eat in a night market setting. The braised chicken was a little on the bland side for me as there wasn’t enough sauce to go with it. It was also lukewarm. It definitely couldn’t compare to the Chinese team’s dish. It would have been smarter for the Thai team to stick to one dish and make sure it was perfect, rather than juggle with two dishes. With that said, they still managed to pull off two delicious dishes so they deserved a pat on the back. Next we lined up at the Vietnamese stall (green team), made up of Brent and Tracy. Their dish was a Vietnamese banh trang with chicken and pork rice paper quesadillas. Before I lined up, I overheard people saying it was difficult to eat and I saw their rice paper crumble in their hands and juices flowing all over the place. We were told to ‘get our hands dirty’ as this was their actual intention. It turned out that when we got our tacos, they had improved the mechanics and it didn’t crumble much at all. I believe they changed the way it was cooked so that the taco wasn’t as dry. The dish itself was quite delicious. It was lighter in flavour compared to the Chinese dish again, but still well balanced with traditional Vietnamese flavours like fish sauce and mint. I also liked the different textures the dish had which was a result of the crispy rice paper. All in all, this was probably the most creative dish that night. I found it hard to decide whether this dish or the Thai team’s tuna dish was my second favourite. I later found out that Tracy had burnt her hand during the challenge but decided to continue cooking. Even with such pain, team Vietnam did a great job. This shows just how much the contestants want to win! I had high hopes for team Japan (Ben and Renae) as my favourite cuisine is Japanese. The long line was deceiving and I was a bit let down by what I got. Their dish was an udon noodle soup with chicken and soy balls and a tempura seafood cake on top. The tempura was a bit over-fried and seemed a little oily and too crunchy. Good tempura batter is usually light and fluffy. The udon noodle itself was a bit bland and it was hard to coat it with the soup (all on the bottom of the takeaway box). As this was the last stall for us, they had apparently run out of enoki mushrooms and replaced it with raw bean shoots instead. Raw bean shoots isn’t an ingredient you’ll find in regular Japanese dishes, it’s more used in Vietnamese and Thai cooking. I didn’t think it complemented the dish much. The chicken meatballs were a bit dry and overcooked and had a strong ginger taste which is again not a usual Japanese ingredient. The dish was overall a bit under-flavoured and I wouldn’t say is true to Japanese flavours. For this reason, this was my least favourite of the night. We finished lining up at the stalls early so we had time to take in what was happening around us and to truly appreciate our participation on the set. We were interviewed more than once during the night (I had stage fright so said some stupid things) and chatted to fellow fans about their experience and what they thought about the dishes. 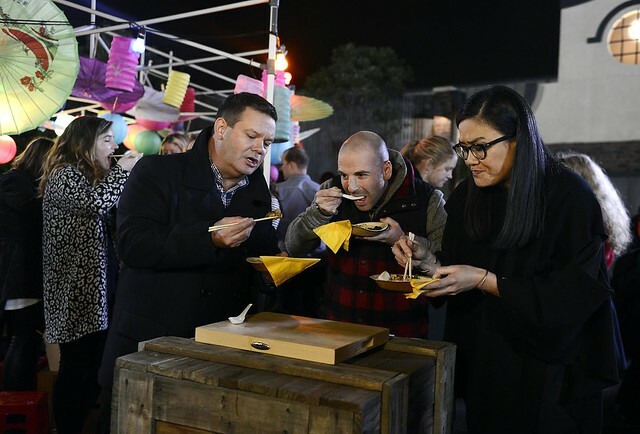 We watched George, Gary and Kylie taste all of the contestants’ dishes while the camera rolled. It was all quite surreal and fascinating to see them in action. The excitement and energy was undoubtedly very high, but the contestants didn’t seem at all nervous! In fact, they seemed more relaxed than some of us tasters! We cast our votes and are now eagerly awaiting to see which team will come out on top. The calibre of contestants this season is really phenomenal and I feel so lucky to be part of it. Fingers crossed for all of the contestants tonight. I know I will be sad, no matter who the losing team is. Tune in to Channel Ten at 7:30pm tonight to capture the details and soak up all the energy!! You might even catch a glimpse of me with some luck. Remember also that MasterChef Australia airs at 7:30pm between Sunday and Thursdays. Thanks for this awesome post and congratulations!